Description: Westbound on the move at the garbage dump crossing in Everett. Description: Westbound waiting at the garbage dump crossing for a favorable signal at PA Jct. Description: BNSF 4658 parked in the spur. Description: A set of three GE abominations roll towards Northtown with a grain train. Description: Last unit in an FXE-UP-BNSF lashup. Description: Grain train, Garbage local in the siding and the M-PASTAC1-23A in the background. Description: CSX Q385-29 accelerates westbound through Akron, Oh on a snowy winter day. Description: CSX Q389 is stopped at Route 13 in Greenwich, awaiting Q114 to clear up ahead in town. Description: CSX Q389 accelerates towards Greenwich interlocking. In the distance, Q138 approaches. 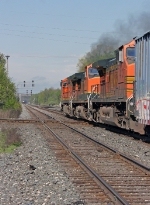 Description: BNSF Northbound Vehicle Train V- BIRCLO ( Birmingham, Al. to Clovis, NM ) passing through Palos, Al. Description: Stupid pole got in my way.